A rendering of the second phase of Valley Brook Village — Courtesy: Peabody Properties Inc. The bank said it was providing a $6 million construction loan to the Affordable Housing and Services Collaborative Inc. and Peabody Properties Inc. 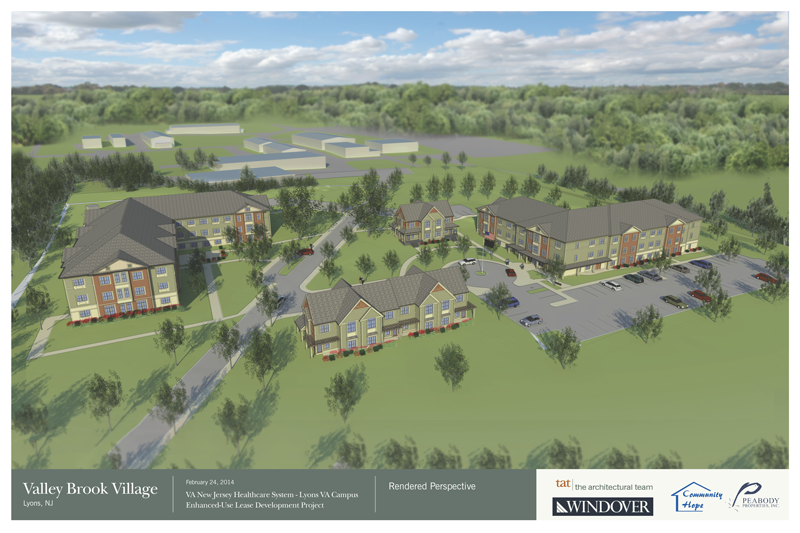 The funds will aid the expansion of the existing 62-unit Valley Brook Village in Bernards Township, which the bank said is a first-of-its-kind supportive housing development for homeless veterans. The second phase calls for a new three-story building with 50 one-bedroom units, which will be situated around a common green to complement the existing village-style community. Windover Construction Inc. is overseeing the development of the permanent housing for homeless and at-risk veterans of all ages and branches of the military. Valley Brook Village offers on-site support services for homeless and disabled veterans. TD Bank also touted its proximity to nearby health care services and public transportation, along with a shuttle service, landscaped walkways, shared outdoor spaces and a state-of-the art learning center. Construction has started and is expected to be complete by next September. Valley Brook Village is built on land provided through the U.S Department of Veterans Affairs’ Enhanced-Use Lease Program and is part of the agency’s New Jersey Health Care System campus in Bernards. The township, Somerset County, the V.A. and several private foundations, including The Home Depot Foundation, are also providing funding. TD Bank said the project is part of its initiative known as The Ready Commitment, a multiyear program designed to open doors for inclusion through community giving in financial security, a vibrant planet, connected communities and better health. Tags Affordable Housing and Services Collaborative Inc. Bernards New Jersey Health Care System Peabody Properties Inc TD Bank U.S Department of Veterans Affairs Valley Brook Village Windover Construction Inc.